You know when you set out to interview a complete stranger, but instead you end up with a new friend who somehow totally understands your love of weeding other people’s gardens, staring into space, and eating at gallery cafes? 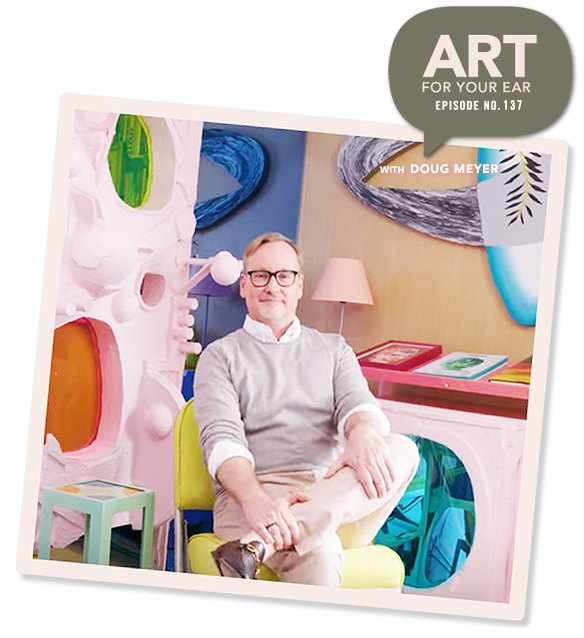 Yep, my plan had been to interview New York based artist, designer, and general creative genius Doug Meyer about his beautiful new book, but as usual, one thing led to another and we wound up talking about WAY more than that. You can listen right up there under that still from New York Magazine’s video about Doug’s amazing apartment, or you can subscribe on iTunes. Well, now I want one for each member of my entire family, mounted on that crazy beautiful wallpaper. So gorgeous, so powerful, and so important. ps. I had to throw in that group of heroes I found on Doug’s Instagram feed… it makes me really happy to see a bunch of them hanging out together. Thanks to Doug for sharing all of his hilarious/inspiring stories; thank you to Saatchi Art for supporting the episode, and great big thanks to you for listening. There will be more Art For Your Ear next weekend. I’m not sure I could live there for an extended period of time, but damn am I willing to try! thanks for listening, judy! … and yes, i completely agree!